The difference between Good-Better-Best is just pennies per installation. Available Colors for Painted Screws. Call (877) 800-2500 for custom colors. Raytec takes screws to a new level. While others may sell any old screw, including screws designed specifically for indoor use, Raytec understands that screws, hidden hangers and other fasteners hold up the entire gutter installation. Screws are a serious component that deserve serious respect. 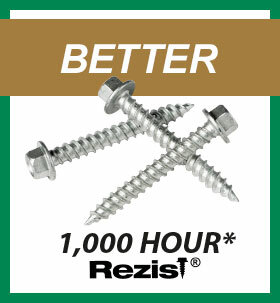 All Raytec screws exceed ANSI/ASME dimensional standards. 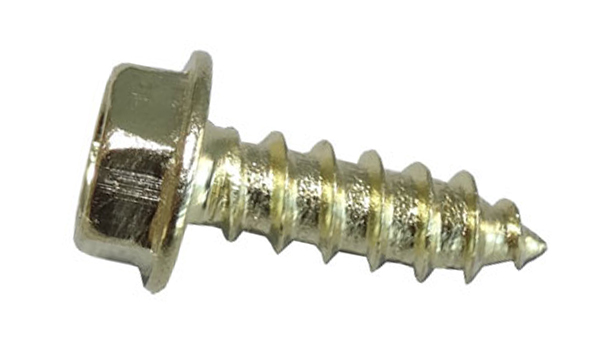 All screws have magnetic, self-piercing, ¼ inch, hex washer heads. All screw heads are taller so they can be driven in faster with less wear and tear on the cordless tools, nut-setter and the installer. Representative screws from each lot are Salt Spray Tested in accordance with ASTM –B117 standard. Engineered for outdoor use. 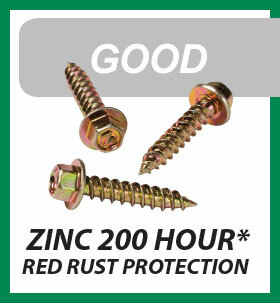 Gold in color up to 200 hrs red rust protection as tested in Raytec’s in-house salt spray chamber. 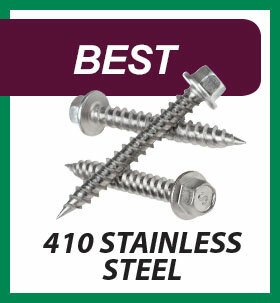 Compare with the common silver screws which may provide 24-48 hours of rust protection….which are not designed for outdoor use. Proprietary coating. Up to 1,000 hours red rust protection as tested in the salt spray chamber. 410 alloy has carbon so it is magnetic and can be heat treated. The carbon may sacrifice itself to the elements and form a film of oxidation but will not deteriorate further. Ask about 300 Series Non-Magnetic Stainless, Brass, custom colors and sizes. Raytec screws are tested in a salt spray chamber in accordance with American Society for Testing and Materials – ASTM B117 standards.